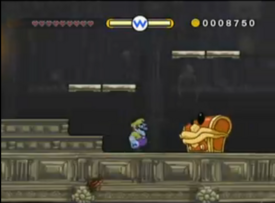 Boogie Mansion is the third secret level of the Quiver Cliffs in Wario Land: Shake It!, as well as the final secret level in the game and final platforming level. It is very similar to its non-secret counterpart, Bad Manor, but the treasure chests are actual living beings. The only way to defeat these and get the item inside them is to throw a bomb at them. Many enemies here include Spinbats and Peek-a-booms. This is also one of the two levels to contain Mini Barrels. Many obstacles here include spikes and thorns. This page was last edited on December 11, 2018, at 18:25.